Today is "officially" Memorial Day. However, in my mind, it is more aptly named "Memory Day." Today is the day that Americans everywhere need to stop what they are doing for a few minutes to remember. To remember those who fought wars to make America what it is and to keep it what it is. To remember those who lost their lives protecting our way of life. To remember those who were wounded and forever changed as they protected out way of life. To remember whose who stood behind the warriors fighting for us. The families. To remember what the United States of America was founded for. Freedom. To remember those who continue to fight for that freedom. Take a minutes now and just think about soldiers. Think about them and thank them from the bottom of your heart. It isn't about if you agree with the politics of war. It isn't if you think a war is "right" or "wrong." It is about remembering that there are brave men and women who stand for our country and fight so that the rest of us, so many of us, don't have to. This morning I got up (thanks to a very, very annoying kitty who shall remain nameless! ), tugged on my suit and headed out into the already warm morning. Even though I was listening to my devotional podcasts, I could still hear the birds chirping as they flitted through the clear, blue sky. The sun was peeping over the rooftops trying to catch my eye while I watched squirrels scurrying across the road. Swallows dipped and swooped in their hunt for insects on the wing while the Grackles accompanied the process with their repertoire of clicks, chatters, and cackles. Further down the road, the golf course was waking up with flags being put into the cups as the greens were being mowed. Ducks floated silently on the mirror surface of the pond until the mower came just a bit too close. Hidden in the trees bordering the fairway, more birds added their songs to the cacophony which was the morning. Passing a house on the corner, a dog sequestered behind the wooden fence barked a greeting to me. Or maybe it was a warning. This message was transferred from house to house and dog to dog as I made my way down the street. In the empty lot a pair of rabbits became statues at my approach even as above them Swallows created intricate patterns in the sky. Perched on the edge of a gutter, a hawk twisted its head around to watch my entire progress down the street. It ignored the pesky Mockingbirds who were launching an attack on its back. Finally having enough of both the attackers and of me, the hawk launched into magnificent flight to alight gracefully in the tree across the street. From the sounds, I could tell the Mockingbirds were continuing their assault. Closer to the pool, small flocks of birds flew from tree to tree as if playing "follow-the-leader." The waterfall of the pool made delicate melodies as I entered the pool enclosure to begin my daily routine. Suddenly, there was a loud roar. Then another. Speedboats on the lake flew past towing skiers who gracefully darted from side to side jumping the wide and rough wakes left by the boats. As if irritated by the sound, fish jumped from the water nearer to the shore and then disappeared back into the blue depths. Michael Jackson's voice floated on the air from a pontoon boat waiting for the speedboats to pass so that it could traverse the lake. Shedding my walking clothes, I stand calf deep in the cool water taking one last look at the lake and listening to the birds before taking a deep breath and jumping in. Later this afternoon I will find myself transported to the magical, musical world of Avenue Q. What could make for a better day? Now that my early doctors' appointments are done, I can catch up on what else has been happening this week. Let's see. . . First of all, Skor has a new "actor" in his "Kitty Entertainment Center" cast. Mr. Squirrel. Most of the time the squirrel is on the ground but he does like to get up on the windowsill to see if there are any stray seeds up there. That makes Skor really angry. On Wednesday, I went to lunch with my friends from ASL/Interpreting (after my doctor's appointment). There were ten of us and we had a good time. There are the people who left at the very end. A few people had to leave a little earlier. There is a fun video at the end of the blog showing just how much fun grown women can have without any alcohol or other mind-altering substances! My new "big" Peace Lilly plant is going gangbusters. The blooms are lovely - and TALL! If you look, you can see three blooms. However, there is one more but . . . it is different. This "bloom" looks more like it couldn't make up its mind. Leaf or bloom? Leaf or bloom? You do see the white "Bloom" towards the bottom of the lightest leaf, right? In other news . . . I got back into my walking/swimming routine this morning. I am still really enjoying the swimming even though it wasn't overcast today so I was more in the sun than I would have liked. I didn't see any wild life - probably because the pool man was there cleaning everything! Hubby and I have started searching for a new car/SUV/whatever for me. Personally, I don't really enjoy car shopping but . . . you do what you have to do, right? We checked out Toyota's last night as well as Nissan (the dealerships are right next to each other!). Sadly, there really isn't anything out there right now (in any make or model) which excites me. I guess that means we just get to keep looking . . . . RATS! If/when we finally decide on a new car, I will make sure to show you pictures! That is about it. Not too exciting of a week, was it? Anyway - here is the zany video taken at my lunch on Wednesday. Enjoy! Voice Update: Doing well. I didn't read last night - primarily because we were out at the dealerships pretty much all evening and when we got home we were tired from being out in the heat ( over 90 degrees!). My voice is doing fine at the moment. There are still some problems (unvoiced consonants) but, I am back into the groove of working on them! No - I am not going to do a "normal" blog this morning because I am off to a different doctor - just for a check up. Yesterday went well. It went well if you can call the doctor being 45 minutes behind at 9:15 in the morning well. Luckily, I didn't have anything to do until I met my friends at 11:30 so I hung out and read my book while I waited - fun, fun! Hopefully, the doctor today won't be running behind - even though she ALWAYS is! Voice Update: I didn't read last night because I talked to my mom on the phone. Due to the doctor appointments I haven't been IMing her so there was stuff to catch up on. I think an hour or so (Okay - maybe it was TWO hours) on the phone covers my talking for the day, don't you? Just a short note to let you know that I am off to the endocrinologist today so I don't have much time to blog. This is just a regular check-up. However, I am fasting for my blood draw and, right now, I could pretty much eat a horse! Voice Update: Doing okay. Working on my oral reading and working on getting my other exercises back on track to! Today is the second day that I actually swam as part of my morning walk! Yeah! It is so great that I thought I would show you what the pool looks like. I learned yesterday that the real name of this kind of pool is "Infinity Edge" because the edge is designed to look like it goes on forever. In this shot the edge really isn't done justice. From inside the pool, it looks like the pool just joins the lake beyond those trees. There is a little shade structure. That is my bright green bag on the table. On the other side of the pool is the bathroom house and the pathway to the "spa!" This is the "spa." I haven't used it but I like looking over the edge of the pool to see what is happening down there. Of course, since I am the only person swimming at this hour of the day - nothing is ever happening down there! I don't have a good picture but, there are a lot of "Knock-out Roses" planted around the pool and this morning while I was relaxing before heading home, I saw my very first Texas Hummingbird visiting the roses! It was neat! Mom and I are having a discussion (via IM) about if I should start putting hummingbird feeders out to see if the little birds would visit my house. I don't know . . .
Now an interesting question. After swimming (and walking home and watering the flowers) I rinse my swimming suit to get the chlorine out. However, our water is heavily chlorinated so . . . is the rinsing doing any good? Voice Update: A bit rocky but I am back on track with my reading (the exercises still need a bit of a "goose" to get them back on track). I am into 2 Kings now and cruising! 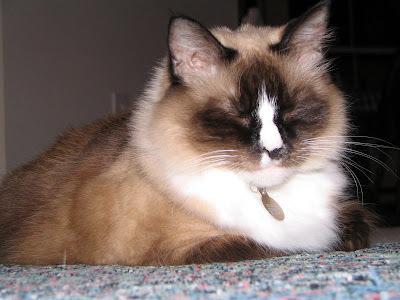 After a prolonged battle, I finally convinced Miss Cleo that since it is my picture on the blog that I should be the one who actually writes the blog. I wish I could say that she accepted this gracefully but, at the moment she is sulking in her cat tree house. After a week of fighting with Migraines, I headed downtown Dallas to see this musical. Now, I should tell you that yes, Hubby went with me to the show. No, he didn't enjoy the show at all but, he went! Husband points! Truthfully, the show wasn't too bad. I think that for those of us who grew up reading the Little House books and watching the television show (Even though I never really watched the show) there was a big feeling of nostalgia which made the show seem better than it was. 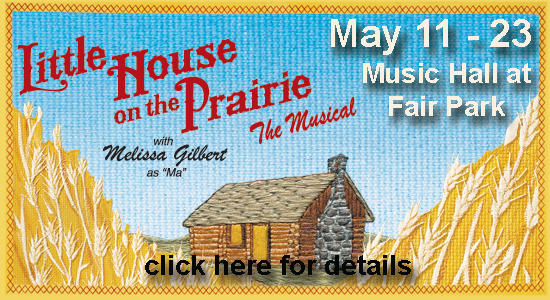 Melissa Gilbert, the original "Laura" on the television show, played "Ma" in the musical. It was nice to have her in the show because of her history but, she really can't sing. Her songs, thankfully, were few and far between. Kara Lindsay, who played Laura, was excellent. She has a nice, strong voice and a wonderfully charming manner in her dialogue. The many impertinent lines Laura had in the show were delivered perfectly by Lindsay and even though, at times, her voice played as older than her character, she was enjoyable to watch. The rest of the cast was adequate bordering on good but the actress who played Nellie Oleson, Kate Whelan, almost stole the show several times. Her hair was perfectly coiffed in the requisite golden curls and her costumes were appropriately flouncy. When Whelan sang "Without an Enemy" in which Nellie bemoans Laura's leaving the town to teach school, she really showed her singing and acting chops. That song was one of the most enjoyable of the entire show. Would I pay money to see this show again? Probably not. Was I happy to sit through it once? Yes. Would Hubby EVER sit through it again? NO WAY! In other news, the key to the swimming pool came in the mail on Saturday and I actually WENT SWIMMING this morning! Can you believe it? I donned my swimming garb and grabbed my bag containing my towel, sunglasses, sunscreen, pool key, and timer (to make sure I get home in time to "chat" with Mom via IM) and I hit the sidewalk. I trotted off to the pool and the key worked like a charm! Shedding my walking shorts, shoes, socks, and tank top, I plunged in. Okay. I really didn't "plunge" into the pool. First I took one step down into the seemingly chilly water. Then I took another. Then I took the last step which, for some unknown reason, seems to be twice as long as the others. There was a moment of breathlessness as I adjusted to the temperature of the water and then I was off and swimming. Since I haven't swum in something like a millennium, my swimming stamina is a bit less than ideal. However, I did manage to complete ten laps and a lot of floating in my time. The pool is wonderful. It isn't too big but it is designed with a "horizon edge" which seemingly merges with the lake in the background. It was so nice to float along and look out on that view. Today the sky was pretty overcast with dark clouds (I am hoping for rain, of course) so I didn't have much of a problem with the sun. However, I will need to make sure that I am careful about not getting sunburned while I swim. I am hoping that the time I swim - in the morning - will keep the possibility of the burns to a minimum! I can't wait to do it again tomorrow morning! That is about it for today! I plan to go grocery shopping and to purchases some tickets to see Avenue Q with my friend Donna. Exciting, huh? Voice Update: I didn't do much reading this weekend. On Saturday, we saw the musical and went out to eat. By the time I got home, my headache was back so I went to bed for a nap to try to get rid of it. Sunday I played hand bells for three services in church which wasn't too good for my head so I went home and . . .took a nap. It isn't too easy to read out loud when you are sleeping off a headache. My voice is showing that I haven't been too vigilant with my exercises. It is breaking more and it is annoying. I guess I should stop stepping on SD's toes and get back into the rhythm of the dance. My name is Miss Cleo and I have commandeered this blog. I took a look at what Momma was posting and I noticed that she was showing you a lot of pictures of the big, white, fluff-ball, Skor. Where are the pictures of me? True, there is a picture here and there but nothing compared to Mr. Fuzzy-head. Well, I demand my say! I am just as cute at Skor - probably even cuter! Okay - so opening my eyes in photos isn't my strong suit. You do have to admit that my little white nose is pretty darn cute, though! And just look at this! How adorable can you get? Here I am cleaning up my front paw so I look perfect for my next picture. Skor doesn't do that. He just thinks he is "all that" au-naturel! Just look at this talent - I posed and posed for the camera. Each time Momma called my name I rolled onto my back to show off my cute little tummy. What? You think I am a bit chubby? Hey - I don't mention YOUR weight, do I?? A good stretch is called for after so many glamor shots. However, I am still making sure to pose for the camera. Yeah, right - I am soooooo impressed. NOT! Hey, what can I say? When you've got it, you've got it. And I certainly have it! Now I need to go and make sure that I am getting my fair share of pets around this joint. Well, after two rather painful days of dealing with a horrible, horrible migraine, I seem to be back on the right road. True, I still have a bit of a headache lurking at the back of my head (an unusual place for my headaches to hide out) but, I managed to get up this morning. Not only did I get up but I actually did all my morning things. Hubby left the house with a lovingly prepared lunch and then I hit the sidewalk for my morning walk. Luckily, it wasn't too warm yet when I left the house. It was a nice 68 degrees with overcast skies and a nice breeze. Of course, when I walked past the adult swimming pool I felt a strong longing to jump over the fence and to plunge into the cool water. Not that jumping over the fence is anything I could accomplish in this lifetime or the next - it is about eight feet tall! Anyway - I passed up the pool and continued my walk enjoying the refreshing spray of sprinklers along the way. (You know it is summer when I actually walk through the sprinklers instead of around them!) Once I was home I tended to my flowers. Hubby was kind enough to water my backyard plants last night after I tried but the combination of heat and headache didn't allow that to happen. I am so happy that all of my plants are doing well. I even managed to do a little weeding (darn that Bermuda grass with its runners!) while I was out there! So - today is off to a good start. I will probably take a few Tylenol to keep my headache at bay before I go out to do anything today. Let's see. What did I want to tell you? Oh, right! The pool key. I emailed the property manager about my apparent lack of the correct pool keys and got an email back that they will send me the appropriate keys ASAP. My question - why didn't they just mail them to me back when they changed the keys in the first place? Oh well. I will hopefully be swimming next week. In addition to the key situation being worked out, I was thrilled to find a package from The Good Flea in my mailbox yesterday (okay, Hubby actually found it because I wasn't in any shape to walk down to the mailbox)! I won a book on her blog a while back and it arrived yesterday! I can hardly wait to start reading! Thanks, Flea! That is all the excitement in my life today. I hope you are all doing wonderfully on this fine Friday! Voice Update: Doing okay but I haven't done any reading for a day (I managed despite the headache on Wednesday) or so. I will have to get back on the wagon regarding that. Needless to say, I also didn't do my exercises yesterday. Not good. Not good! Migraine . . . . Migraine . . . . Migraine! This is just to let you know that I didn't fall off the face of the earth - even though I would like to do so at times! I simply have a migraine which just won't let go of my head. It started yesterday and I thought I had it under control. However, it crept back in last night and today has been BAD! I think I have slept pretty much all day and still haven't vanquished the beast. Hopefully, after another night's sleep, I will feel better. I have things I want to do tomorrow and a Migraine just won't help things At All! Voice Update: Actually - I have no idea. I haven't really been talking too much yesterday or today. I did talk to my mom yesterday morning and my voice seemed to be good. I also read (I am now into 1 Kings!!). Today - I have managed to mumble a bit to Hubby (who is home with a bad stomach - don't we make a nice pair?) but not too much other than that. Today was the day! I was going to start swimming in the mornings in the middle of my normal walk. The community's "Adult Only" pool is about halfway through my walk and I finally bought a new swimsuit so . . . why not? This morning I woke up, made Hubby's lunch for the day, ate breakfast and read the comics and then I "suited up." I put on sunscreen, dug out a beach towel. Got a bag together to lug the towel, the sunscreen, sunglasses, and the key to the pool. Then I pulled on my walking shorts and a t-shirt (it was a bit chilly today and I thought the tank top I have been wearing might be a bit too chilly). I grabbed my iPod and got my shoes on. I was ready. Listening to my devotional podcast, I headed down the sidewalk. All the time I was full of anticipation. I could hardly wait to dive (okay - jump since diving isn't allowed) into the cool (or warm) water and feel that wonderful buoyancy. To feel the water close over me so silkily fluid and cool (or warm). As each step took me closer to the pool, my anticipation grew. I acted cool but inside my heart was racing with excitement. I was going swimming! Confusing the dog who likes to bark at me from his back yard, I diverged from my normal route to cross the street to the pool. Now, this pool, and the "Family" pool are kept locked for safety reasons and also to keep non-neighborhood people out. I rummaged in my bag and pulled out both of the keys I had brought (since I have NEVER used them I wasn't sure which I would need). First, I tried one. No luck! I didn't have the right key! Poodles! After heaving a huge sigh and looking longingly at the sparking water in the pool just beyond the gate, I headed back home, finishing my normal walking route. Let me tell you - you can get REALLY sweaty when you are walking with a swimming suit under your clothes! Instead of walking with gradually drying hair I was gradually getting wet hair from the sweat sliding down my neck. At home, I watered the flowers and then came into the house to go through the key closet to find the correct key. Nothing. I have no clue where this key could be! I am a bit disheartened. But . . . I will keep looking and I WILL swim. Hopefully, it will be soon! Voice Update: I didn't read out loud yesterday because I talked to Mom on the phone instead. Due to an early morning appointment, I didn't IM with her (or blog) yesterday so we caught up on the phone. My voice is doing really well. True, I still struggle with certain words (much to Hubby's delight!) but, they are slowly (!!) coming along! Friday. I had big plans for Friday. There were things that I needed to do, people I needed to see and placed I needed to go. Then I woke up feeling less than motivated. Sure, I saw the people I needed to see and went where I needed to go but the things I needed to do . . . well, those got sort of pushed aside. Why? Well, because I felt like this all day. It was raining and everyone knows that is the perfect time for a nap. Or two! Wake me up in a couple days! I would rather go out and smell the flowers! Of course, now I am paying for my lazy day because I am going to have to scramble to get everything ready for me support group meeting. I guess that is what I get! I hope your day is much more productive than mine was! Voice Update: Doing good. I am into 2 Samuel and going strong. So far I continue to hear hesitations in my voice on those unvoiced consonants and certain words are still difficult to get out. However, overall I am pretty happy with my voice. I am still dealing with the emotional issues arising from people insisting that I don't have SD. I think that might be a bit difficult today at the support group meeting. Then again - I haven't had much of a response that anyone is coming so . . . maybe not! I'll let you know! A Suite, If You Please! Yesterday was heavenly. I spent a lazy day napping, reading, watching the birds with Skor, and petting the kitties. Of course, I should have been working on stuff for my SD support group meeting tomorrow but . . . I didn't so I will have to get that done today! Before I forget and get to bogging about other things I want to show you the suite that Hubby and I had while in Colorado. Now, technically, it was one room with two sections but . . it still felt pretty fancy to me. Normally we just have a regular room and are lucky if there is a chair to sit on! Here is the sitting area from one angle. The chair was comfortable and the light behind it perfect for reading. Not that I had too much time for reading! In the little counter area there is a small refrigerator and a microwave along with a coffee pot. There was Wolfgang Puck coffee. I contemplated taking some for my dad but didn't. To the left, in this picture, is the bathroom. I was going to take a picture of that too - it had a neat vessel sink (which ended up being a bit of a pain to use) and a nice furniture style vanity. However, Hubby was "using the facilities" so - no picture! Here is the other side of the sitting area. The couch and pillows were nice. The flat screen TV even nicer. I only wish it swiveled so it was more easily viewed from the comfy chair! Here is the divider between the sitting room and the bedroom. The desk - which was on casters for some odd reason - was a nicely set up thing with ports to plug accessories into the television on the wall and wireless Internet access (technically they had wired access also). The vases on the divider were glued down and weren't glass or breakable. Smart! Here is the divider from the bedroom side. To the left of the divider is the closet door. This is the view from the bed. ANOTHER television! Hubby was in heaven! Here is the bed - slightly less perfect than when made up by the housekeepers! There are six fluffy bed pillows and the red, round pillow. I determined that the red pillow was perfect for "bopping" Hubby on the head! The bedspread had neat dragonflies on it which matched the shower curtain in the bathroom. There you have it - our "suite" while we were in Colorado! Wasn't that thrilling? I will admit that it was a very relaxing room and I wish that we had spent more time in Colorado so I could have enjoyed it more. Oh well! Maybe next time! working on an old iTunes gift card to distract him. Odd cat!) and I got to test out my voice on him. It is working well today. I have noticed a bit of trouble on my Hs and my Ps lately but I am thinking that I am just listening harder for SD characteristics to prove to myself (again) that I really do have SD. Wow - this thing really does a number on the confidence! I'm done! I'm done! I'm done! I am done with my interpreting class! Yesterday I finished up my written test via the computer. There were only six questions but they were all essay questions so the test took a while. Wanting to be very careful after my disastrous midterm experience* I took almost the entire length of time we were given. While I haven't gotten my grade from that as of yet, I am hoping I did well. * To refresh your memories . . . during midterms I took the midterm test on a computer in the college library. These computers are set up to allow each person only one hour of time on the computers. The computer that I logged into apparently hadn't been logged out of by the previous student and his/her time was still counting down. When I started the test, the computer started giving me time warnings. Not sure what was going on, I thought that the test was timing out instead of the computer and I rushed to answer the questions - which you couldn't go back to again once you answered them. This caused me to be less than thorough on my answers! Last night, at about 9:00 P.M. I stepped into the classroom to complete my "practical" section of the test by actually interpreting. By about 9:30 I was done with EVERYTHING! Can you tell how thrilled I am??? Even better, the teacher said that I have a B+ or maybe - just maybe - an A! I won't hold my breath for the A but hey - I don't think that either grade is bad for someone who was predicted to fail because she didn't take Intro to Interpreting! Did I mention that I am done? I'M DONE! Now I can "settle down" and concentrate on other things. Like my SD support group meeting this Saturday. While I am still having problems deciding about my desire to remain committed to NSDA amidst accusations of not really having SD, I am going to continue with the support group - at least for this week! I have a lot of information to share with the group and hope to make up some simple information sheets to pass out. My problem with that is that my beloved card program doesn't like to interact with my new computer system and Windows 7. Due to this I am going to have to install the card program on the old computer upstairs and hope I can get stuff printed from up there. We will see how that goes! Besides support group work I also need to get working on my shrubs (I never finished trimming the front shrubs) and the house. Doesn't that sound like fun? Maybe you would like to stop by and help out! Voice Update: I am doing well with my voice even though I didn't have speech yesterday. Thinking it odd that I hadn't gotten a reminder call, I called the office before heading out to confirm my appointment. Imagine my surprise when I learned that not only didn't I have an appointment yesterday but that I didn't have any scheduled for the future! None! Apparently I didn't get on the new schedule with my normal "every two week" appointment. The first appointment I can get now isn't until the first week of June so . . .I am on my own until then! I was hoping to get some refreshers for those "new" exercises but . . . I guess I will keep working on them from what I remember. Well, today is my final in my interpreting class. I met with some friends yesterday to review and to discuss possible situations for tonight's "practical" exam during which I will need to actually attempt to interpret. To tell the truth, I am just a bit nervous! I will also be taking the written test today - which is actually on the computer. That I am not too worried about because we can use resources (books!). This afternoon before all the wonderful testing I have speech therapy with Susan. I must admit that while I have been doing my reading and "regular" exercises, I haven't been working on the new exercises she gave me last time. I am certain I will be told what a slacker I have been! Oops! In the meantime, look what I found when I was out watering my plants this morning! My lovely cactus (which Hubby HATES) is blooming. Blooming a LOT! While the blooms were not fully opened I took tons of pictures. This bunch is clustered down low near the pot. The contrast between the delicate flower and the spiky leaves just intrigues me. There are still more blooms to come . . . This is one of my favorite shots - the close up and the combo of the flower with the buds surrounding it just make me smile! I am so proud of my cactus even though I had absolutely nothing to do with its prolific blooms! Well, that is it for today - I hope the lovely blooms brighten your day! Voice Update: Doing well but struggling a bit more than normal. I am not really sure what is up with that other than being a bit tired from my Colorado jaunt and then a bit stressed about my final! I guess Susan will give me a work over today and then I will need to keep going with my exercises - both old and new! - and reading! It is another beautiful day in my neck of the woods! I walked in low 70 degree weather with a very nice breeze for most of the trip. The sky was overcast so I didn't have to fight the sun to see where I was going (and I didn't have to really worry about sunburn - yes, I know you can get sunburned on an overcast day!). The Magnolias are in bloom here and smell like heaven! Tomorrow I will try to give you some pictures. Today my camera battery died while I tried to take pictures! So - in the meantime - here are some more shots from our trip to Colorado! Here is a shot of Downtown Denver (with a McDonald's sign!) taken while driving down the road. Hubby located a local brew pub online and was eager to go so . . . The pub was right across the street from Coors Field. So - I had to take some shots of it! I like the silhouettes on the side of the stadium! Hubby and I had fun exploring the area a bit - we didn't do too much because we were tired and I had that altitude headache! Well, I am going to post this and get ready to go to my study group for my final. Voice Update: Doing well. I am having some some problems with H's but only in certain words and if they are at the beginning of the sentence. The words which were tripping me up are still problems but . . . working on it! I have gotten back into reading out loud and have now finished the book of Judges and am moving on to Ruth today. Happy Monday! I am back in Texas and it feels good to be home! The altitude headache I had for most of the weekend is gone (to be replaced with allergy headaches, I am sure!) and a night in my own bed does wonders for the soul! Let's start with the topic of my last post. The main point I was making was that I was feeling very discouraged by the questioning of if I had SD or not, especially by people higher up in the leadership ranks. Their questioning made me, in turn, question if they were as supportive to me as they might be due to their questions. After all, why would they want me in their leadership ranks if I was a "faker?" After stepping back for a while, sleeping in my own bed, and taking my morning walk, I am much less emotional about the topic. I am still not "over it," I am thinking a bit more clearly. Maybe I DO need to move on to other things in my life other than focusing on SD. Maybe someone else with a more "typical" SD voice SHOULD take over the support group. Maybe, maybe, maybe. Obviously, I have some more serious thinking to do. I am going to focus on my final (Wednesday) and my next support group meeting (Saturday) and then I will think more on this topic. In the meantime . . . here are some rather poor shots of the Colorado mountains. We were a bit too far away for good pictures but, my trusty purse camera did its best! This evening, I was blown away by the sunset. Look at those rays shooting out from behind the mountains! I missed the "perfect" shot because Hubby thought I was taking a picture of him but, this will do - don't you think? Before the sunset, I was just amazed by the mountains themselves since we don't have this kind of view in Texas! It seemed like the clouds always "lowered" in the evenings but, that could just be the Spring. The clouds were pretty interesting in themselves, I thought. I have more pictures to "bore" you with but that is it for today! I am still trying to get adjusted to being back in Texas! Plus, I need to study, study, study for my final! Voice Update: My voice is doing pretty well. I am having a few "issues" with the word "Hi" but, that isn't too bad when you consider all the words I can say! I will get back on the oral reading today! Down, Down, Down I Go . . .
Greetings from Aurora, Colorado! That is right, I am actually posting something on my blog from a totally different state from the one I live in! Yeah! Thank goodness for hotels with free internet access and computers without people waiting in line to use them! Anyway, the Regional Symposium just finished up (about an hour ago) and I thought I would check in with my bloggy friends for a bit. Just to say "Hi!" And to let you know that I haven't fallen off the face of the earth. And to make sure YOU are all okay. And . . . okay - maybe I need to vent a bit while I try to make a decision. First of all, let me tell you that this weekend has been full of lots of very good information. The leadership training day on Thursday - which was to provide additional training to support group leaders, area contact people, and other NSDA leaders - was chock-a-block full. We all learned about the recent initiatives which have been undertaken and the progress on all older initiatives. We investigated a few different areas such as the "virtual support group" and visiting colleges which have a Speech Language Pathology major to talk to graduate level SLP students about Spasmodic Dysphonia. The Regional Symposium today was also very informative. Three Otolaryngologists from Denver were in attendance and they all presented information on SD, Botox injections, and Surgical "treatments" for SD. These doctors really impressed me, not just for the information they presented but also for their very personable demeanors and their wonderful senses of humor. They answered questions from the audience with empathy and intelligence and they really made the "scientific" portion of the day interesting. Let me tell you, that is important! After the doctors, four SDers formed a panel to talk a bit about their experiences and to field some questions from the audience. It was a day of good information and everything was well done! ***If you want to know more about Spasmodic Dysphonia or if you would like to make a donation to the NSDA, check out this link. The information was good an the people were wonderful as usual. Well, pretty wonderful. If you read my last post you know that I had some anxiety about this meeting and, as it turns out, I managed to "find" additional anxiety while here. I don't know if it is because I was already feeling anxious about some issues or if I am just learning the "real" deal or what. ****The NSDA is a wonderful, wonderful association which is doing a great job helping people with SD and with raising awareness of SD. None of my comments in this blog are meant to negate that fact. ****The people involved in the NSDA are amazing, dedicated people who are doing many good things to help further awareness of SD and to help people who have SD. I am very thankful to have met each and every one of these people and to have had the chance to interact with them. They are a real blessing. None of my comments in this blog are meant to negate that fact. Okay, that said, let me start. The people who come to these NSDA meetings (the Leadership Meeting and the Regional Symposium) are wonderful people. They are friendly and nice and generally fun to talk to. Since this is the second year that I have attended the leadership training I recognized many of the people from last year and so I felt like I was just continuing my relationship with them. As I stated in my previous post, some of the people have their doubts about if I really have SD. This year, this issue was brought up again - in a very "gentle" manner - by a couple people. Somehow, despite my anxiety, I didn't mind. Probably because I know that I DO have SD and I have faced these kinds of questions before so I was ready for them. Include the fact that my husband is here and he is incredibly supportive of me! However, I was totally unprepared to find out that people who are in higher leadership positions in the organization also have their doubts about my having SD and that they have shared these doubts in discussions with other SDers. Okay. I don't mind that people talk about me. I have come to realize that, for some reason, I tend to be the topic of conversation for many people for a wide variety of reasons. The fact that the higher leadership factions of the group were openly doubting my SD. That sort of "hit me where I live." Here I am, passionate about spreading the word about Spasmodic Dysphonia and about helping others who have Spasmodic Dysphonia and my "legitimacy" is being questioned. If people are questioning me, why do they want me in any kind of leadership position? Why would I want to be in a leadership position in an organization which apparently doesn't support me 100%? Do they think that I am trying to get sympathy or something so I "faked" symptoms of SD? Do they think that my speech therapist, who is VERY experienced in dealing with SD, and the Otolaryngologist who diagnosed me, who is also VERY experienced in dealing with SD, are trying to "pull a fast one?" I understand that currently my voice doesn't sound like the voice of a person with SD. Of course, I still hear breaks and symptoms of SD and Hubby still hears them but, that is because we live with it day in and day out. Okay - I feel like crying because I am thinking of this. I think I am going to have to finish this up tomorrow or at some other time. I hope you are all doing really well! Voice Update: My voice is doing really well. I have been talking more than I normally do during the past couple of days of meetings and I have noticed that I have more fatigue in my voice than normal. I have also noticed more breaks than usual (lately!) but, all-in-all things are going well. I have not done any oral reading while here in Colorado because I figure the extra socialization I do (which, of course, involves talking) more than makes up for that hour of time. I will certainly get back on the horse (so to speak) when we return home. When I first "discovered" that I would be dancing with Spasmodic Dysphonia for the rest of my life (even though I originally thought it would only be a short dance - the lifetime commitment was realized a bit later in the process!) I was filled with anxiety. Anxiety about my job. Anxiety about my social life. Anxiety about my marriage. Anxiety about my identity without a voice. Anxiety about speech therapy. Anxiety about Botox injections. Anxiety about the future. As I slowly learned the steps to this new dance (and how to avoid stepping on SD's toes causing it to get angry! ), my anxieties began to lessen somewhat. The first to go was the anxiety about speech therapy. My therapist is wonderful and we soon had developed a good working relationship which helped my voice. Next to slink into the background was my anxiety about Botox shots. They weren't too bad. Thankfully! Then the marriage anxiety dissolved as Hubby proved that, once he got over the "shock" of my SD, he was a wonderful support and a loving partner. Hubby doesn't always understand everything that I am going through but he tries. The job anxiety and the future anxiety receded into manageable issues which are still floating along with the music in the background as SD and I dance along. Every once in a while they poke their heads into my immediate thoughts and cause some stress in my life but, when they do that, I try to just take deep breaths and to "let go and let God." As my voice improved, thanks to speech therapy and LOTS of voice exercises, my anxiety about my social life vanished. I not only found that my friends understood and still accepted me but also that people I just met could also handle the information about my vocal disorder. I became very direct about my SD and told everyone way more than they ever wanted to know about it whenever I could. Joining NSDA and starting a SD support group really helped me banish the social anxiety caused by SD. Meeting other people who experienced the same thing I was experiencing really helped me to understand that I wasn't alone and I also wasn't a "Freak!" The anxiety about my identity remains the one which torments me more than any of the others still lingering about. However, as the days go by and I stay in step with SD to perform a smooth dance, things get a bit brighter. Until it is time for a NSDA symposium and leadership training. Don't get me wrong. The NSDA symposium is a wonderful thing. So is the leadership training. There are wonderful people there who have dedicated themselves to helping others learn to dance smoothly with SD. Being with these people is inspiring and comfortable. Never is it needed to explain about bad voices or to apologize for not being heard. In a lot of ways, the symposium and the leadership training is like "coming home" to a place where you are accepted unconditionally. My voice is doing really well. So well, in fact, that people I meet for the first time don't even notice that there is anything wrong with it. People I know, and who have known me for a while, can occasionally hear slight breaks but, for the most part, they never think about my voice as anything but "normal." This is wonderful. Right? Well, here is the ironic thing. People at the NSDA symposium and training day tend to think that I don't really have SD. They insist that my problem must have been MTD (Muscle Tension Dysphonia) which is easily cured. I have to "defend" myself and my reason for being involved in the NSDA. There are times I feel like these people see me as an "intruder" because my voice is so good at the moment. I have worked so long and so hard to get my voice into the shape that it is in and I continue to work on it daily to maintain my progress. God has really touched my voice to allow such amazing progress. Why do these people shake my confidence so much? Why do I dread having to face these people? Why do I continue to feel the need to validate my SD? Why do I feel such anxiety? Why do I feel like I should just keep my mouth closed so that people won't feel compelled to challenge me? I DO have Spasmodic Dysphonia. I DO have a good voice because of a lot of hard work and a lot of grace. I DO belong in the NSDA. Why do I feel like I am between both worlds - the "normal" world and the NSDA world? Voice Update: Doing really well. I was having some issues with the word "hello" yesterday but I really worked on some exercises and that got better. I am now reading in the book of Judges and the reading is doing wonders for my voice. I think that the anxiety about the upcoming symposium is doing a little "work" on my voice but, I refuse to get out of step with the dance, darn it! No - my house did NOT flood - thankfully! The water I saw this morning was pouring out of the ground and making part of my normal walking route a river that had to be forded. Let's just say it was tough to keep my feet dry! Being the good citizen I am, I stopped and took a look in the irrigation control box to see if I could turn the bubbling geyser off. No luck. The box was filled to the brim with water and I wasn't going to reach in to try to turn off water when who knows what kind of wiring could be in there! So . . . I trotted home and called up the Home Owners' Association's office to report the geyser. I was asked if it was an emergency. Hmmmmm. Well, no one was going to be flooded out or killed so probably not. The only problem would be a VERY high water bill for this month! Once that was taken care of I hit the computer eager to check out the free download of the week on iTunes. I am in the process of downloading it right now so I have no clue if it is good or not. Sometimes that darn free download is the most exciting thing about my Tuesday! Currently, I am listening to a LOT of Beatles and Beatles cover band music. My odd goal is to get every song in my iTunes library listened to at least once. With 6300+ songs this is a tough thing to do - especially when the iTunes DJ keeps throwing in songs I have already listened to once or twice or three times! There isn't a way to have it only include songs that have never been played before so . . .I am going through my playlists and doing it myself! 50's, Alaskan Music, and Barbershop are all done - now it is on to the Beatles. Currently I am listening to son 115 out of 500!!! My vast library of songs did come in handy for amusing some friends on Sunday as we were looking for "Do and Don't" music to possibly add to our group project. Let's see - oh, I am in the middle of studying for my final in my class. There are books and papers everywhere, much to the consternation of poor Hubby. At least it will be over soon. No, the final isn't tomorrow but the sooner I start, the more I remember, right? Tomorrow is the LAST official class for this semester and it couldn't have come soon enough to suit me! To be honest, I did learn a lot this semester but, I feel I could have learned a lot more with a different environment. Oh well, that is the way the ball bounces sometimes! That is about it from my neck of the woods. What is up with you? Voice Update: Still reading my way through Joshua. I hit a nice long patch of city names and king names last night. I struggled through them with Hubby laughing in the background and repeating names he particularly liked (Libnah, anyone?). See the kind of support I get?? Anyway, I guess I should be thankful that Hubby is coming with me to the NSDA symposium this weekend. My voice is doing really well even though it was a bit "faint" while I was reporting the water situation this morning. Hopefully, it was just a bit "rusty" and wasn't reflective of a set-back! Every morning I head out to hit the sidewalks for my walk and the kitties . . . well, they wait. When I get back from the walk, I water flowerbeds. The kitties peer at me from various windows as I travel around the house watering. Then I head back inside to "talk" to Mom on IM. The kitties . . . . they wait. Over the past weeks they have decided upon the absolutely best places to wait. I thought I would show you. This is the view when I head out to the entry way. They are both waiting . . . and snoozing! Miss Cleo likes to curl up against a wall so Skor can't sneak up on her. Skor prefers to go "undercover." It took me a couple days to actually figure out just where he was because I don't normally look under plants for my cats! I will say that I love sleepy kitty paws. They are so darn cute! Okay - my kitty fix is satisfied so I can go on to other topics! This week marks the last regular class session for my interpreting class. YEAH! Of course, there is still the final to contend with so . . . I will be studying for that before Hubby and I head off to Denver for the weekend (NSDA meeting!). Speaking of the trip - I haven't even started to think about packing and all of that good stuff! I guess I need to do that BEFORE class since we are leaving Thursday morning! The laundry should be done before packing . . . yikes! That is a lot of work I need to get working on! Well, I had best be off to get to work! Voice Update: Doing really well. I still struggle with "two and cut" and a few other words but, when I look back on what my voice used to be like . . . I am doing really well. In the Bible (oral reading) I am out of Deuteronomy and into Joshua. I feel like I have really achieved a lot even though I am still WAY in the beginning of the Bible. Hopefully, the listing of names will calm down for a while. That is just funny to hear when I struggle through those! Sorry I missed you all yesterday. I was a bit busy in the morning so I couldn't get to the blog and when I got home . . . I was in the mood for a nap! This morning is beautiful in my neck of the woods. Things are really looking good in my flowerbeds. Take a look! What is this? A ripe strawberry? The first of the year! Not a bad size either! Right after this shot, I ate this berry and it was very good and sweet! Here are some lovely Lemon Drop flowers! They certainly add a nice splash of yellow to the bed! Well, I think I am going to allow the pictures to do the talking today. I will post again on Monday (hopefully with something interesting to say!). Have a fabulous weekend! Voice Update: Doing well. I am working on the new exercises that Susan gave me. They are not very easy at the moment but, hopefully, with time they will become second nature. I am still reading (even though last night I spent that hour talking to Mom instead of reading) and doing my "regular" exercises. Fun, Fun! I just looked at the calendar and realized that next week Hubby and I will be heading to Colorado to attend the NSDA's leadership day and symposium. What fun!